What does the split between Reviso and e-conomic mean for your app? Read the rest of "What does the split between Reviso and e-conomic mean for your app?". Read the rest of "We are re-indexing our data". Got an API sync job? Read the rest of "Got an API sync job?". Read the rest of "New invoice totals REST endpoint". 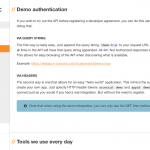 Read the rest of "New feature – /app-settings in REST API". Read the rest of "e-conomic SOAP API now requires you to specify a custom X-EconomicAppIdentifier header". Read the rest of "New feature – Voucher attachments in REST API". Read the rest of "We have deprecated the .NET SDK". Read the rest of "REST API in the works".